Tofu is the white one and Mochi is the black one. Tofu, we jumped on it, we chined it, it's ours, right? Hey, hoomin, what are you looking at? You can have the box. No, really, we mean it. You can have it, chin it if you like. I get the box! I get the box! Yay - no more sleeping on the floor! THANKS! 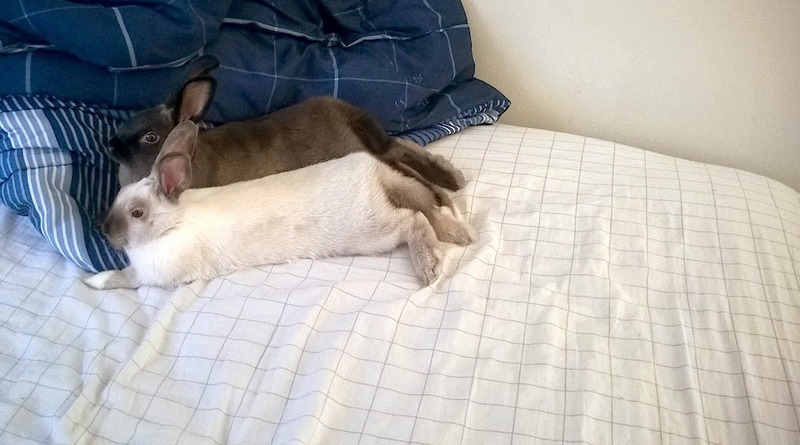 Ah, yin and yang bunnies; just an endless loop of Disapproval. I watched the banana video. Although Tofu successfully used the brain cube, it was clear that she disapproved of buns being separated from banana treats. She played along to humor you. 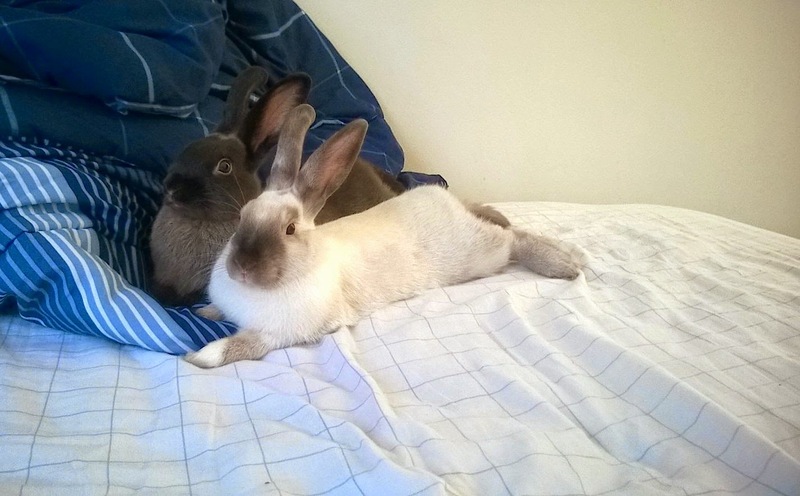 These are two very fine-looking rabbits! Tofu and Mochi deserve their new bed. The hoomin will be honoured to have been allowed to have the box. Bunnies usually have boxes to bunstruct, so Tofu and Mochi have been very generous to allow the hoomin to have it! Why don't I ever get to chin anything? No bunny has ever offered me a box. What am I? A grooming brush? Nail clippers? They are beautiful and clearly got all the recessive genes for bunny civility. I want to cuddle them. Sally, I watched the video, too. Did you notice how often the bunns checked to see if the camera was still rolling? I don't think they wanted to be caught on film getting even with the guy who kept talking about short attention spans. Not that there would have been anything really wrong with it, but it just wouldn't be very appropriate for streaming. Elizabeth, I am sure your bunnies are up to the task of getting you through any mourning period, but please let the bunns vet the next guy.